This site is a tribute to KWFM, Tucson's first and only progressive free form rock station. KWFM launched some legendary radio careers, all of whom helped build the station's definitive sound. KWFM had a longstanding tradition of involving the listener, whether it be through giveaways, road trips, parties, festivals, contests, concerts, dinners  anything for a good time. This site attempts to continue that tradition by offering a wealth of photos, bios, airchecks, concerts, commercials, spots, print ads, and trivia. We hope you enjoy the browse and come back often as we are frequently adding new content. If you have any KWFM trivia, playlists, airchecks, photos, memories, dates... anything... we'd love to hear from you! We would definitely like to encourage any members of the former staff to contribute their bios and any memorabilia they'd like to share. And don't forget to sign the guestbook! I'm ready to buy a new pair of Sony MDR3 headphones! This ad wih Karen Stern sold me! December 1980 in Good Times. Airchecks page. The shows are from January, 1976. Many thanks to Matt Scholp for contributing an aircheck of his uncle, Steve Howser from Sunday night, December 3, 1972. Ever wonder how we figure out the exact dates? All the clues are there... in this case, just Google one of the football scores Steve announces. Just added new photos to the Gallery, contributed by John Shook... see photos from the Old Tucson concert here. We also added a few new guest artists here including John Prine, Tom Rush, Graham Nash and Marcia Wallace. Thanks, John Shook! The KWFM 2010 Reunion Special from Clear Channel's studios and broadcast on KWFM 1450 AM. Thanks to Margie Wrye and Kimberly Craft for all their hard work. KWFM Staff Reunion in Tucson! At long last, Jim Hardy gives us an inside look at what happened during the Sandusky years. It's a great read! Kimberly Craft has contributed a few airchecks from 1981 and 1983. KWFM presents their first live concert from the Night Train with The Dixie Dregs on August 23, 1979. Doug Jaffe was rummaging through the attic and discovered an excellent aircheck of Arty LaVigne from November, 1975. Thanks, Doug! Dave LaRussa and Jim Brady give us a tape of The Lost Gonzo Band, live at Lee Furr's, from the Thrills tour of 1976. This is a much overlooked group that still sounds just as fresh today. Thanks to Jim Blackwood for the remastering work. KWFM welcomes Richard Torrance & Eureka, live at Lee Furr's, from the Belle Of The Ball tour of 1975. Added another aircheck, this one from the spring of 1977. Thanks to Michael Mackowski, who apologizes for the sound quality. We've reduced the humming somewhat, but this gives a good idea what K-dub sounded like in '77 and features a couple of nice segues. Just added a new aircheck of Mark Young from December, 1974 contributed by Michael Mackowski. Many thanks to Doug Jaffe for applying his audio restoration prowess to tapes. Chris Ryan invites guest DJ Frank Zappa to put his spin on the fate of radio in an exclusive aircheck from October 1981. In 1982 KWFM brought the groundbreaking Rock'n Roll Picture Show to Tucson. Simulcast on KWFM and KGUN Channel 9, the show featured video clips by popular artists. Our new video section features Jim Ray's introductions from a few of the shows. Thanks to Jim Ray for the tapes and Colin LaRussa for the video editing. Several new photos and news clips have been added to the Gallery courtesy of Jim Ray, Lee Dombrowski & Eric Schecter. Joe Crystal's bio page has been updated. Thanks to Luis Trujillo (Radio Fiesta in Phoenix) for providing the photo. On Monday evening, December 12, 1977, the Ozark Mountain Daredevils performed Live at Lee Furr's for a KWFM studio audience. Thanks to Jim Brady for supplying the tapes and Jim Blackwood for mastering. Chuck "Wagon" Maultsby brings his PowerWagon to the stage for another KWFM Concert at Westwood. Fred Casanova tells us more about the early days of KWFM. Tucson's own Central Air perform live for a KWFM studio audience at Westwood. Three new airchecks added from December 11+12, 1979 featuring John Shook, Jim Brady and Bob Cooke. Tapes courtesy of Jim Ray. Pure Prairie League perform live for a KWFM studio audience at Lee Furr's. The one hour show is a preview of their Wednesday, October 15th, 1975 TCC billing with the Outlaws and the Marshall Tucker Band. Thanks to Jim Brady for contributing the tapes and Dave LaRussa for mastering. Jim Ray interviews fellow South Carolinian Doug Gray of the Marshall Tucker Band during their 1979 Running Like The Wind tour. Jim Ray interviews Graham Nash from 1980. They discuss the No Nukes project and the new release Earth & Sky. Doug Jaffe was at the controls the day Nixon resigned. Listen to this classic from August 8, 1974. Two new airchecks added, Jim Ray, November 1st and 2nd, 1976. Don't you wish you could have the unscoped tapes? Jim Ray on the air, Friday, October 29th, 1976. These eclectic sets exemplify the sound of Kaydub back in the mid '70s. Thanks, Jim! An amazing collection of Backstage & Studio Photos, contributed by Jim Ray. Bob Cooke hosts KWFM live at Oasis Hot Tubs, broadcast Monday night, August 25, 1980. Chris Ryan in the studio, Bob on the mic, with appearances by Lee, Karen, and David. Features interviews with Bob Meighan, guitarist Richie Cavanaugh, also Mark Smythe & Brian Smith from the Pills, and Tucson club owners Doc Zucker & John Miller. This is the first of many new additions coming from a big box of goodies contributed by Jim Ray. Bob Cooke & Dave LaRussa from April 1981 as well as Dave's second evening on the air from August 1979. Enjoy two more great airchecks contributed by David LaRussa. The Air Brothers Band live from Westwood on KWFM. David LaRussa has contributed several KWFM exclusive interviews from 1980-1981: The Dregs (Unsung Heroes), Al Stewart (24 P Carrots), and Steve Winwood (Arc Of A Diver). 25 Years Ago... Jim Brady counts down the best of the 1970s. This show was recorded the afternoon of January 1st, 1980. Jim counts us down to number 12. A lot of great tunes here, and a few surprises. You'll see the "Anthem Effect" was already in full swing by 1980 as the songs grow longer and longer as the countdown nears its end. How much you wanna bet Free Bird, Stairway, White Satin and Day In The Life finished in the top 10? Perhaps we'll never know. Listen to John Shook on the air January 1st, 1980. Nurse that New Years Day hangover with KWFM's countdown of the Top 92 of the 1970s. Montana among the Top 92...??? Only on KWFM, Tucson. The Dixie Dregs play live for a KWFM studio audience. The Dregs dropped by Lee Furr's the evening of May 30, 1978 in support of their "What If" release. Many thanks to Mark Anderson for contributing the tapes. KWFM presents The Serfers live from Westwood on Dave LaRussa's "Anything That's Rock 'n Roll" show, September 16, 1980. This Tucson outfit later moved to California and changed its name, adopting one of this set's titles, "Green On Red". The Pills! Tucson's own recorded live "On The Air" at Bill Cashman's Westwood Recording Studios. The entire concert as broadcast on KWFM in 1980. KWFM In Concert! "Tune In" to our first featured artist, Tom Waits from 1975. Special thanks to Jim Brady for supplying the tapes, Jim Blackwood & Dave LaRussa for transferring and mastering, and the KWFM staff and the folks at Lee Furr's Studios for this rare and classic recording of a concert promoting Tom's second album. Read Norman Ellis-Flint's bio. Hired by Bill Thayer to be KWFM's first GM, Norman pioneered the "underground radio" format. His distinctive voice is easily recognised from extensive voice over work for radio and TV. Love News Confusion - Interview with Ken Hanks, Tucson Fisheries Biologist. Radio magazine contributed by Steve Zind, prepared by Doug Jaffe. Bill Thayer, one of the station's founders, checks in. 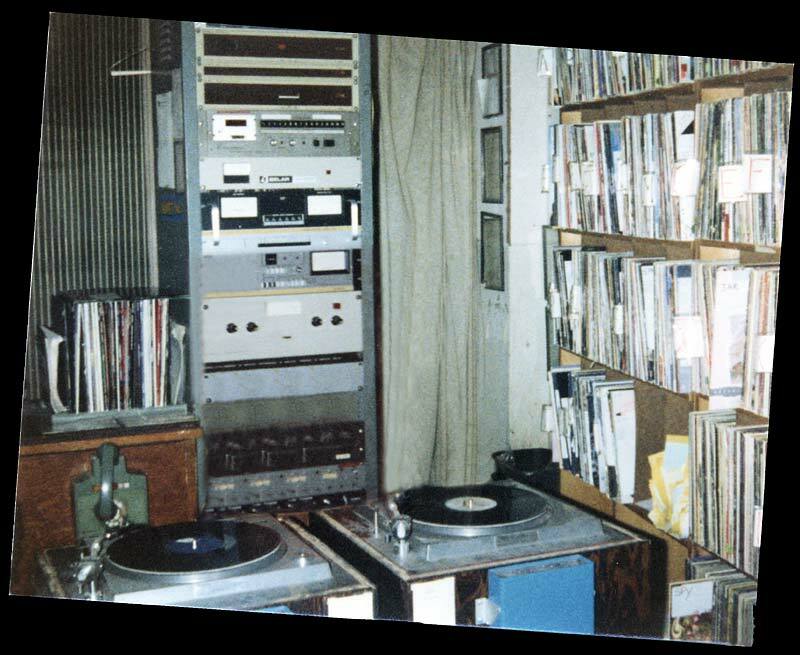 Read the bio and learn about KWFM's first days on the air. Love News Confusion - Interview with John McLaughlin. Perk Clark conducts an outstanding interview with the Electric Guitarist. Recording courtesy of Perk. Love News Confusion. This is the first of a series of 70's Love News Confusion radio magazine shows contributed by Steve Zind, prepared by Doug Jaffe. Another excellent aircheck! Doug Jaffe from 1976. Doug muses, "there's a set in there that sounds like it was intended for you, Tim, 29 years in advance." Another beautiful mix of great music, great segues, and the spirit of KWFM. Contributed by Steve Zind, prepared by Doug. Thanks, guys. Doug Jaffe has contributed a few new spots from 1976. Dave LaRussa conducts an interview with Doug Clifford of CCR, 1980. Original, pre-production tape. Wonderful aircheck of Janie Snyder from early 1974. Voluptuous voice, super segues and an amusing "Lost & Found" report. Fantastic! Mark Young from August 1, 1971 brilliantly edited & contributed by Douglas Jaffe. More sound clips from Doug Jaffe. Read Margie Rye's Bio Page. New photos from Janie in the Gallery & Tune In to some new sound bites from Doug Jaffe. More Playlists from Janie... February & May 1974. Janie just contributed 2 excellent playlists from her shows in April 1973. Carry me back! Check out Eric Spector's playlog from 1979! Welcome to the new site. This site is "stateside" and hosted on high performance servers with 2.4Gb access to the internet. As Las Solanas Consulting physically moves from Paris, France to the Naked Pueblo, we took the decision to move the site early to give everyone a chance to update their bookmarks. Thanks to Lee Dombrowski for several high quality photos, as well as newspaper clippings and ads. A Site Is Born. The KWFM tribute website makes its debut.